Latest trusted brands research by Reader's Digest (November 2013) clearly shows that European consumers are persuaded to buy products and services based on the reputation of the supplier in the eyes of its customers. Each day the marketing media is full of news of the latest campaigns, CRM tools and mobile developments that promise to take brand owners one step closer to their desired customer, client and supporter segments. That’s really exciting and of course there’s a growing industry of technology providers hungry to supply these leading-edge marketing solutions. But building a successful enterprise takes more than just better marketing or even great products and services. "A committed enterprise requires having a clear vision and purpose built on real values. Today, it’s not just what the business does but how it does its business," says Guru in a Bottle creator Ardi Kolah. For example, according to the latest Reader’s Digest Trusted Brands Survey 2013, European consumers are unlikely to purchase a brand they’ve never tried before. They’ll consider buying a brand that’s new to them if it’s been recommended by someone or something that they trust. Recommendation can be personal or take the form of an award from an independent source (like Reader’s Digest). In total, 18, 314 responses across 12 European countries (excluding the UK) were analysed where 71% of respondents said they were unlikely to buy a brand they’d never heard or tried before whereas 74% were prepared to try such a brand where that product or service had been recommended by a friend or relative; won an award voted for by the public (61%) or given an award by an independent panel of experts (65%). An inescapable conclusion of the survey is that trust is hard earned and easily lost. 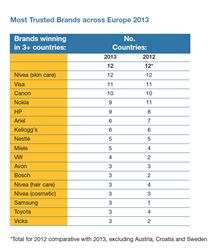 Some of the most trusted brands across Europe include Nivea, Visa, Canon, Samsung, Nokia, Kellogg’s, BMW and VW. 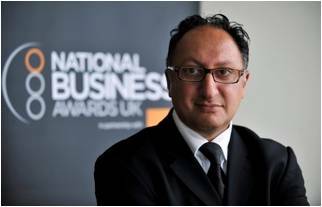 "I’m struck by the challenges facing major high street banks right now that didn’t even scrape in at the bottom of the most trusted brands list," says Kolah. In the UK, the challenges facing the Co-Op Bank, RBS, Barclay's and Lloyds has led to a surge in spending on communications and marketing as well as the search for experienced talent to navigate through these turbulent times for the sector. The banking sector has its work cut out when it comes to rebuilding trust among customer segments and this has not escaped the attention of those in charge. Following the financial scandal in 2012, Antony Jenkins took over as CEO at Barclay's in August of that year. "What he inherited was a mess and he knew it," said Kolah. 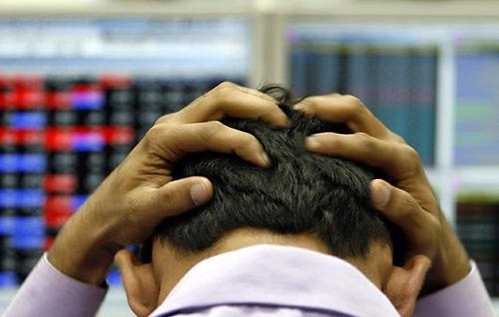 In short, the Libor internal exchange rate scandal demonstrated that the bank had to take drastic action in order to restore its damaged reputation. As widely reported in the The Telegraph, in January 2013 Jenkins announced that bonuses and performance would be linked to a new ‘purposes and values’ framework that was now being put in place to help repair Barclay's shattered reputation. The framework consisted of five values: respect, integrity, service, excellence and stewardship. These values directly connected employees with those that they were being paid to serve. The values of the bank were not about making as much money as possible. Profits were to be a by-product of doing the right things the right way. And in Jenkins book, this meant putting customers first. But words are empty unless they are backed by deeds. So Jenkins quickly moved to indicate what he wanted to see happen. In simple terms, behavior from every single employee that supported the values that he and the board were now embedding in the enterprise and this in turn would secure Barclay’s future as a trusted, respected and profitable enterprise. In a company-wide letter, Jenkins was uncompromising in terms of the new psychological contract he wanted every employee to sign up to. “I’ve no doubt that the overwhelming majority of you, no matter in which area of the business or country you work, will enthusiastically support this move. But there might be some who don’t feel they can fully buy into an approach which so squarely links performance to upholding our values. My message to those people is simple: Barclay's isn’t the place for you. The rules have changed. You won’t feel comfortable at Barclay's and to be frank we won’t feel comfortable with you as colleagues,” he said. New research by Dr Alison Whybrow and Alan Williams has explored how organisations like Barclay's and others now have to translate brand values into daily practices and the behavior of their employees rather than rely on the marketing and communications department to do the job for them. As the internal letter from Jenkins demonstrates, senior managers must now rely on a mixture of psychology, sociology, philosophy, neuroscience, leadership and business acumen to help make this important transition into a value-led culture with the end game being enhanced customer and employee satisfaction and loyalty. “Values are moving from a PR exercise to become the guiding compass. Organisations must now take the whole business of values much more seriously. A public commitment is a commendable start but it then requires rigorous follow through and for Barclays time will the judge of what has been started,” observe Whybrow and Williams. To qualify as strong, values must be translated into measurable practices. They should also help drive vision and be relevant to those things making the difference between success and failure for the enterprise.